The Glen Canyon Bridge carries US-89 across the Colorado River at Page, Arizona. 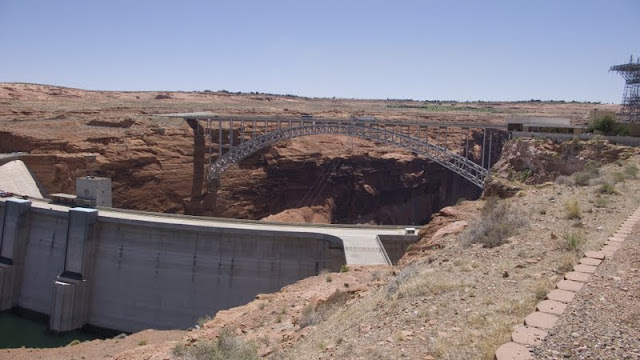 The bridge was built just downstream from the Glen Canyon Dam and was completed in 1959 (the dam wasn't completed until 1966). Like the Alexander III bridge we studied yesterday, this structure is a deck arch, although considerably different in appearance. It has a single 1027 ft (313 m) span between the faces of the canyon's walls. The steel members were fabricated in California, assembled to ensure that everything fit, then disassembled and shipped by rail to Flagstaff, and trucked to the job site. Meanwhile, the sides of the canyon were prepared for the foundation with light blasting and drilling. A tie-back system on towers was used to assemble the arch with rivets. Spandrel columns were preassembled, lowered into position, and attached to the arch. High-strength bolts connected the deck system to the columns and leave-in-place forms were used to cast the concrete deck. The entire bridge was constructed in a single season. The U.S. Bureau of Reclamation oversaw construction by the joint venture firm of Kiewit Judson Pacific Murphy. The bridge was constructed without any fatalities and only a few injuries. More information on this project is in the February 1959 issue of Civil Engineering Magazine. The Glen Canyon Bridge is 700 ft (213 m) above the Colorado River, making it the fourth highest bridge in the U.S. We've previously studied the fifth highest bridge, New Mexico's Rio Grande Gorge Bridge. Both bridges were constructed to avoid obstacles caused by the earth's tectonic activity. The Rio Grande Gorge was formed due to the Pacific Plate's movement with respect to the stable North American Plate. The Colorado River created deep canyons by cutting through sedimentary layers that were slowly rising due to tectonic stresses. As I mentioned, the bridge was part of the project to dam the Colorado River, a controversial project due to its negative impact on the environment. I like to think that bridges are environmentally benign, but often they are not. This bridge was built to provide equipment, material, and workers access to both sides of the dam during it's construction. Arch Bridges: Glen Canyon Bridge by Mark Yashinsky is licensed under a Creative Commons Attribution 3.0 United States License.